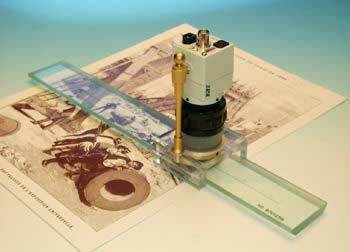 The Video Glass Scale is a new product by which it is possible to measure with an extreme precision (5 hundredth) the distance between two points of a flat surface (e.g. labels, etc.). The pictures are filmed by one or more cameras and can be viewed and saved on your Laptop, or only viewed on a common TV monitor; the reported divisions are very clear and can be easily read by one or more operators contemporaneously. The system is provided with a robust glass ruler with decimal divisions obtained with a special evaporated vacuum chrome and with a video colour lens with annular cold incorporated light. The magnification is about 40X referred to a 14" monitor, with a field of view of 6,7x5mm and it is without parallax error. 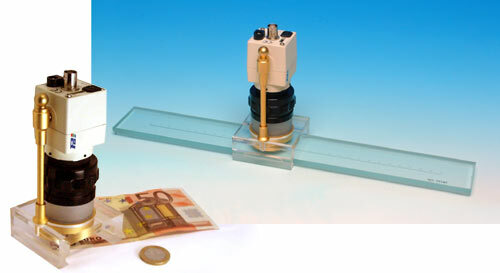 The video lens, supplied with focus regulation, can be easily disconnected from the scale and put on any surface for different controls (e.g. print register). The VGS is now supplied also with USB2.0 interface and VIDEO VIEW light software, that allows to connect it to a laptop or PC Desktop to document the different measurements. Suggested to show quality images, take them, compare them on the same monitor, add a comment on image, make linear measurements, print two images on the same sheet on the same time with or without measures and comments, make movies and many other things.